When Lauren Polstein was a young girl playing softball for her team in Miami, a low pitch popped off the top of the bat and hit her in the nose. She was bruised, but okay and ready to jump back into warm-ups. However, given her injury, she was forced to play with a batter’s face guard. The only problem was that her face guard drastically impeded her vision — and, as a result, her game. Luckily, Lauren’s father, Mike Polstein, had a background in engineering and had an idea for a face guard that Lauren could wear during games. He went to work on his design in the family’s garage and came out with a sleek face guard that not only offered a drastically increased field of vision, but it was also lightweight and comfortable. It wasn’t long before other parents started asking Mike to make face guards for their daughters, too. A few years after Mike created his first face guard, his son Jason joined the team, creating a website for online sales and supplying the product locally to mom-and-pop shops. The business continued to grow, but as it did, the Polstein family agreed to always maintain their small-business, family-oriented ways, putting the customer and the athlete first. During those early years of RIP-IT, face guards were sold out of the family’s garage. But they quickly outgrew that small space and soon after, they moved the business to Mike’s son Matthew’s home in Ocoee, FL. Even after moving to a traditional warehouse, Jason and Matthew found themselves in need of an expansion due to the growing team and demand. This demand for safe, stylish gear has never let up, and today, RIP-IT is the most trusted name in softball. Jason and Matthew Polstein are serial entrepreneurs. They have created startups in industries such as apparel, film, SaaS, and sporting goods. 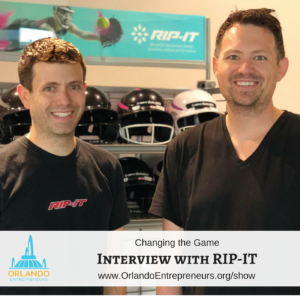 Currently, they spend the majority of their time at RIP-IT where they strive to empower female athletes through beautifully designed equipment. In addition to their roles at RIP-IT, Jason and Matthew are also Co-Founders and Board Members of LateShipment.com. LateShipment.com is a global SaaS platform focused on improving shipping and logistics visibility while simultaneously reducing their associated costs. In 2015, Jason, Matthew, and RIP-IT were honored as a Florida Company to Watch by GrowFL. Additionally, the two brothers are Industry Fellows at the UCF Blackstone LaunchPad where they coach student entrepreneurs.